Ali Marquis, St John Ambulance. 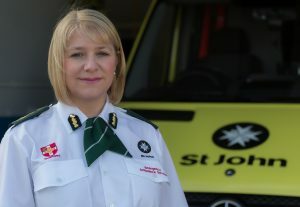 Ali Marquis has been appointed as the new Chief Officer for the St John Ambulance & Rescue Service in Guernsey. Mrs Marquis, who was formerly the Deputy Chief Officer, took up her new position at the beginning of March. She had been acting-up as Chief Officer since the retirement of Jon Beausire in August 2017. Mrs Marquis is the first female Chief Ambulance Officer in Guernsey. Mrs Marquis joined the ambulance service in 2006, following a successful career as a civil servant and human resource professional. She was originally appointed as a senior HR manager with responsibility for organisational development and progressed through the years to Assistant Chief Officer then most recently to Deputy Chief Officer. In the last three years she has been responsible for the oversight of all operational and clinical activities of the service as well as being a Director for St John Training Services. Mrs Marquis is among a growing number of senior emergency service officers nationally who have not come through the traditional operational service ranks and also of only three women to lead an ambulance service in the British Isles. Under a contract with the States of Guernsey St John responds each year to over 4000 emergency calls, and transfers as well a similar number of patients who need to go for scheduled diagnosis and treatment. St John continues to provide a marine ambulance service, inshore rescue and volunteer community responders. As a not for profit organisation providing Guernsey’s only ambulance service, it receives approximately 70% of its funding from the States, raising the rest required to meet the cost of running the service from a subscription scheme, user charges and donations.